Intermediate/Advanced. 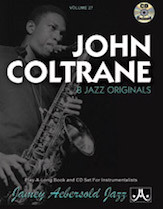 8 Favorite jazz classics from one of the most innovative and influential jazz artists in history, the great John Coltrane. Includes the haunting ballad Naima. Coltrane's compositions explored many new frontiers and opened up new harmonic doors for all who followed. The crisp, tight rhythm section adds much enjoyment to this unique Play-A-Long.